The California Avocado Commission sent us the idea, from recipe developer Rachel Matthews of ASouthernFairytale.com. She takes grilled avocados to a higher level by letting each person select his or her favorite fillings. The concept can be used for sides or appetizers and snacks with beer and wine. Prep time is 1 minute, cook time is 10 minutes, plus prep time for the fillings. Of course, you can also have a plain DIY Avocado Bar, with uncooked avocados. Crumbled or shredded cheese: blue, cheddar, cotija, feta, goat, jack, etc. 1. PREHEAT the grill to medium-high and set out the fillings, plates and utensils. 2. 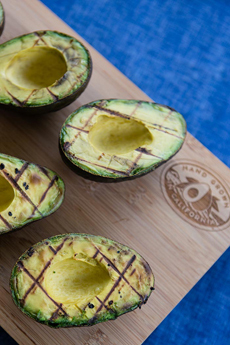 BRUSH the flesh side of each avocado half with olive oil, to keep them from sticking to the grill. Place them flesh side down on a medium-high heated grill. Cook for about 5 minutes. 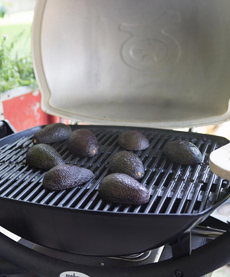 If you want cross-hatch grill marks, change the direction the avocados lie on the grill. Either way, grill them another 4–5 minutes or until you see the skin of the avocado change colors (it’s really noticeable). 3. PLACE the avocados on a platter next to the fillings, and watch your guests enjoy creating their food. Top: Halved avocados, ready to grill. Second: Face down on the grill. Third: Turn the avocados to get attractive hatch marks. Fourth & Fifth: Rachel Matthews’s favorites: Grilled Fajita Avocado and Strawberry Balsamic Avocado. Top photo courtesy Tio Gazpacho, other photos courtesy Rachel Matthews | California Avocado Commission. 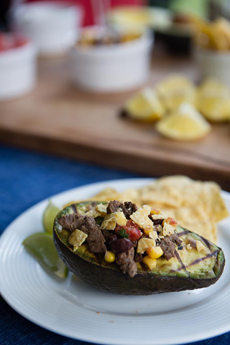 The Fajita Stuffed Grilled Avocado: grilled steak fajita meat, black bean and corn pico, tortilla chip. 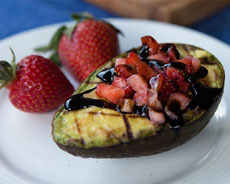 Strawberry Balsamic Stuffed Grilled Avocado: chopped strawberries, balsamic vinegar, feta cheese. 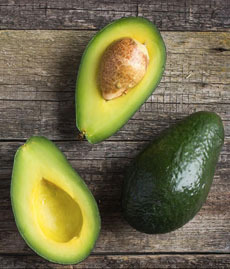 FIND MORE DELICIOUS AVOCADO RECIPES AT CALIFORNIAAVOCADO.COM.